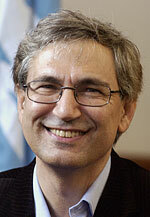 Orhan Pamuk was born 7 June 1952 in Istanbul into a prosperous, secular middle-class family. His father was an engineer as were his paternal uncle and grandfather. It was this grandfather who founded the family's fortune. Growing up, Pamuk was set on becoming a painter. He graduated from Robert College then studied architecture at Istanbul Technical University and journalism at Istanbul University. He spent the years 1985-1988 in the United States where he was a visiting researcher at Columbia University in New York and for a short period attached to the University of Iowa. He lives in Istanbul. Pamuk has said that growing up, he experienced a shift from a traditional Ottoman family environment to a more Western-oriented lifestyle. He wrote about this in his first published novel, a family chronicle which in the spirit of Thomas Mann follows the development of a family over three generations. His second novel, Sessiz Ev (1983; The House of Silence, 1998), uses five different narrator perspectives to describe a situation in which several family members visit their ageing grandmother at a popular seaside resort with Turkey teetering on the brink of civil war. The period is 1980. The grandchildren's political discussions and their friendships reflect a social chaos where various extremist organisations vie for power. Pamuk's international breakthrough came with his third novel, Beyaz Kale (1985; The White Castle, 1992). It is structured as an historical novel set in 17th-century Istanbul, but its content is primarily a story about how our ego builds on stories and fictions of different sorts. Personality is shown to be a variable construction. The story's main character, a Venetian sold as a slave to the young scholar Hodja, finds in Hodja his own reflection. As the two men recount their life stories to each other, there occurs an exchange of identities. It is perhaps, on a symbolic level, the European novel captured then allied with an alien culture. Pamuk's writing has become known for its play with identities and doubles. The issue appears in his novel Kara Kitap (1990; The Black Book, 1995) in which the protagonist searches the hubbub of Istanbul for his vanished wife and her half-brother, with whom he later exchanges identities. Frequent references to the mystic tradition of the East make it natural to see this in a Sufi perspective. Kara Kitap represented a definite break with the governing social realism in Turkish literature. It provoked debate in Turkey not least through its Sufism references. Pamuk based his screenplay for the film Gizli Yüz (1992) on the novel. Yeni Hayat (1994; The New Life, 1996) is a novel about a secret book with the capacity to irrevocably change the life of any person who reads it. The search for the book provides the structure of a physical journey but bordered by literary references, thought experiments in the spirit of mysticism, and reminiscences of older Turkish popular culture, turning the plot into an allegoric course of events correlated with the Romantic myth of an original, lost wisdom. According to the author, the major theme of Benim Adim K?rm?z? (2000; My Name is Red, 2002) is the relationship between East and West, describing the different views on the artist's relation to his work in both cultures. It is a story about classical miniature painting and simultaneously a murder mystery in a period environment, a bitter-sweet love story, and a subtle dialectic discussion of the role of individuality in art. Pamuk has published a collection of essays, Öteki Renkler : Seçme Yaz?lar Ve Bir Hikâye (1999), and a city portrait, Memories and the City (2006). The latter interweaves recollections of the writer's upbringing with a portrayal of Istanbul's literary and cultural history. A key word is hüzün, a multi-faceted concept Pamuk uses to characterise the melancholy he sees as distinctive for Istanbul and its inhabitants. Pamuk's latest novel is Kar (2002; Snow, 2005). The story is set in the 1990s near Turkey's eastern border in the town of Kars, once a border city between the Ottoman and Russian empires. The protagonist, a writer who has been living in exile in Frankfurt, travels to Kars to discover himself and his country. The novel becomes a tale of love and poetic creativity just as it knowledgeably describes the political and religious conflicts that characterize Turkish society of our day. In his home country, Pamuk has a reputation as a social commentator even though he sees himself as principally a fiction writer with no political agenda. He was the first author in the Muslim world to publicly condemn the fatwa against Salman Rushdie. He took a stand for his Turkish colleague Ya?ar Kemal when Kemal was put on trial in 1995. Pamuk himself was charged after having mentioned, in a Swiss newspaper, that 30,000 Kurds and one million Armenians were killed in Turkey. The charge aroused widespread international protest. It has subsequently been dropped. The White Castle / translated from the Turkish by Victoria Holbrook. - New York : Braziller, 1991. The Black Book / translated by: Güneli Gün. - New York : Farrar, Straus, 1994. The New Life / translated by Güneli Gün. - New York : Farrar, Straus, and Giroux, 1997. My Name is Red / translated from the Turkish by Erda? M. Göknar. - New York : Knopf, 2001. Snow / translated from the Turkish by Maureen Freely. - New York : Knopf, 2004. Istanbul : Memories and the City / translated from the Turkish by Maureen Freely. - New York : Knopf, 2005.